Suresh Rajan reviews a book by an extraordinary young woman with an inspiring story for anyone dealing with diversity issues. IN REVIEWING BOOKS over the years, I have come across people who are clear thinkers. But I believe that I have now come across a person who I can describe as one of the clearest thinkers I have ever come across. That person is Carly Findlay. Carly has ichthyosis. 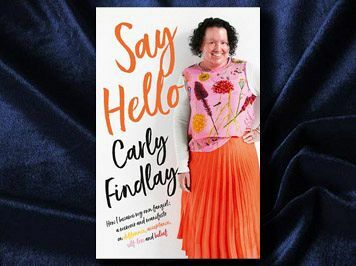 And Carly has written a book about living her life with this condition and disability. Yet her book is not meant to be read only by those with the condition. Nor is it to be read only by people with a disability of some kind. This is a book that needs to be read by anyone who deals with issues of diversity. All of her discussions and considerations in the book are just as applicable in the race space — a space I am more comfortable in having a strong base of knowledge in. When people say “true beauty is within”, which has happened a lot in the response to media around Say Hello, they really mean I can’t possibly be physically beautiful with a facial difference. The clarity of this remarkable young lady’s thinking is evident early in the book when she discusses our mutual colleague and her friend, the late Stella Young. The very title, ‘Say Hello’, is a brilliant line. Many years ago when I was conducting a “Multicultural Awareness” session at the University of WA, I was accompanied by a dear Noongar brother of mine, Dennis Eggington. At one point in the discussion, the students asked Dennis what they should do if they saw a group of Aboriginal young men hanging together outside one of the night spots of Perth. Dennis’s reply was, “say hello”. And so it is with Carly. The ichthyosis causes a redness of Carly’s skin. This then generates the second looks and the trepidation to speak with her. And, as Carly says, what better way to cut the ice than by saying “hello”. Carly is a person who knows herself well. She understands how others perceive her. And she is determined to remove any preconceptions people may have about her, as a person with a condition, as a person with a disability and her, importantly, as a person. She discusses the social model of disability as opposed to the medicalisation of conditions that we used to apply in Australia. The book has application in a variety of spaces. When Carly discusses the issues in the context of her ichthyosis, there is a far broader application. Her discussion of the discrimination and ableism that she faces almost on a daily basis is ‘an even bigger barrier to my happiness and progression’ and yet she has achieved much in her life to date. There is little doubt that Carly is a leader in the space of disability, diversity and difference. She is a person to be reckoned with, even if purely for her clarity of thinking and reasoning. There are many lessons to be learnt for all of us from reading ‘Say Hello’. If there is one chapter that I would ask everyone to read many times over, it is chapter 23. This is titled ‘Letter to my unborn child’ — a remarkable piece of writing and demonstrates the depth of Carly’s thinking of the issues that surround these matters. ‘Say Hello’ is thought-provoking, it is raw and it is honest. It is brutal at times. It also engages the reader and, very early in the piece, you do develop a strong sense of endearment to the author. You want her to win those battles that she engages in and you will cheer her on. It does challenge your assumptions and preconceptions and that is a very worthwhile thing. ‘Say Hello’ is a highly recommended read for everyone.